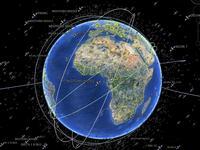 A free Google Earth .kmz download shows near-real-time (updated every 30 seconds) satellite positions in space. 4 layers include Active Satellites, Inactive Satellites, Debris, and Rocket Bodies. This tool can be used to help visualize the quantity and locations of satellites (and their orbits) in 3D, and can also be used to locate specific satellites.